Online pre-registration is now closed. You can register at the Onsite Registration Desk at the Columbus Convention Center. You may complete the onsite registration form and bring it with you to Columbus expedite the onsite registration process. Please contact AVAreg@conferencemanagers.com with any questions. The Single Day registration fee includes access to the main meeting sessions, general sessions, exhibit hall, and meal functions for only the date purchased. Exhibit Hall-Only passes grant access only to the Exhibit Hall and meal functions held in the Exhibit Hall for the date purchased. Pre-Meeting Workshops are not included in the Main Meeting registration price. Attend two 4-Hour workshops for and receive a $100 discount! "Wait, What?" "I'm being sued over an IV?" All major credit cards and checks are accepted. To register online using a check, please go through the entire registration form and enter your check number on the payment page (or TBD, if the check has not been issued). Then, simply mail the check with a copy of your confirmation email to address below. If paying via check after 9/6, please register online, and bring your check with a copy of your confirmation email to the onsite registration counter at the Columbus Convention Center. Payment must be received before registration materials may be retrieved. For more questions about online registration, email AVAreg@conferencemanagers.com or call 703-964-1240 x360. Mail checks to: AVA Registration Department 5526 West 13400 South Ste, #229 Herriman, UT 84096 Checks should be made out to "Association for Vascular Access". Groups of 4 or more can receive a discount on full meeting registration, and should register online to take advantage of the group rate. Groups of 4 or more attendees will be eligible for a $50 discount on each full meeting registration. Example: 5 attendees registering for the full meeting will receive a total $250 discount on the registrations (5 attendees x $50 = $250). All registrations must be submitted at the same time, making one payment to receive the group discount. Discount cannot be applied to registrations that are not submitted as a group. Discount applies to attendees only; exhibiting companies purchasing additional personnel badges are not eligible. To register a group online, please fill out the registration form for the first attendee and click “Add Additional Registrant” before you proceed to payment. 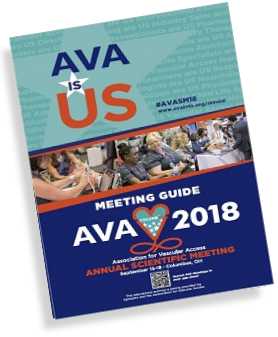 As an AVA Scientific Meeting attendee, you have been asked to provide your name and other contact information so that we can send you updates on this meeting. AVA may also send you emails and/or mailings in the future to share information regarding AVA membership, or upcoming AVA events. You will be asked to select your privacy setting when you register. 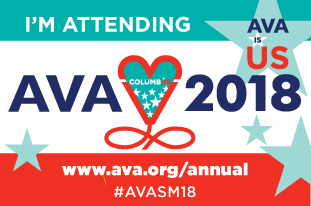 Written notice of cancellation received by the AVA 2018 Scientific Meeting Registration Manager, no later than 11:59 PM EST on August 17, 2018, will result in a refund of registration fees paid less a $50 processing fee. Please submit cancellation requests to AVAreg@conferencemanagers.com. If initial payment included a membership fee, the membership fee will not be included in the refund. Refunds are not permitted for cancellations received after 11:59 PM EST on August 17, 2018. All refunds will be issued utilizing the same method as the initial payment. No-shows are non-refundable. Substitutions are encouraged and should be submitted to AVAreg@conferencemanagers.com. Please include the original attendee's name and the substitute's full contact information. If the substitute's registration options are different from the original registrant's, the registration fee difference will be charged. Written notice of cancellation received by the AVA 2018 Scientific Meeting Registration Manager, no later than 11:59 PM EST on July 20, 2018, will result in a full refund of workshop fees. Written cancellation noticed received no later than 11:59 PM EST on August 17, 2018 will result in a refund of workshop fees paid less a $50 processing fee. Please submit cancellation requests to AVAreg@conferencemanagers.com. Refunds are not permitted for cancellations received after 11:59 PM EST on August 17, 2018. All refunds will be issued utilizing the same method as the initial payment. No-shows are non-refundable. For additional information, or for changes/cancellations, please contact the Registration Department at AVAreg@conferencemanagers.com or call 703-964-1240 x360. In the unlikely event of conference cancellation, AVA will refund 100 percent of registration fees paid. AVA assumes no liability for any penalty fees on airfare tickets, deposits for hotel accommodations, or any other fees, charges, penalties, or other incidental costs that a registrant might incur as a consequence of cancellation. Registration fees are not deductible as charitable contributions for tax purposes. Consult your tax advisor, as they may be deductible under sections of the tax code. Due to the professional nature of this conference, children under the age of 18 are not permitted in the educational sessions or the Exhibit Hall; unless prior arrangements have been made through AVA.